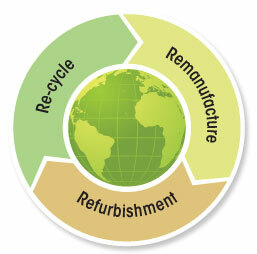 The concept of the Circular Economy and associated remanufacturing strategies are new to many. However, these processes are well established in some industrial environments. APDI prides itself on being a Company of technical competency and commitment to our customer’s requirements at all levels. Senior staff & Engineers are highly experienced technically having spent many years in manufacturing/remanufacturing environments. Customers can confidently discuss technical and commercial aspects of the business, knowing that their requirements will be understood and resolved quickly and effectively. As a result APDI can offer a total solution to your remanufacturing requirements. Dedicated engineering resource allows the Company to work on a range of electro-mechanical products from concept stage through to sampling, testing and supply, delivering products which, often have a working life longer than that of the OE product. In parallel our experience in the Reverse Supply Chain allows us to work with, or on behalf of our customers to implement an efficient core return strategy ensuring maximum benefits are realised. Thus delivering the financial and environmental benefits as defined in the Circular Economy that only remanufacturing and recycling can deliver. Kaizen teams enable us to draw on our valuable experience as a resource for process refinement. All areas of our business are reviewed for efficiency and effectiveness from receipt of incoming product,to BOM content and work instructions, to testing and packaging/identification requirements. Combining our customers product knowledge with APDI’s remanufacturing expertise our customers now save between 40-60% against new buy cost, generating £M’s of savings annually, providing huge environmental benefits through precious raw materials savings and reduced landfill. APDI Ltd welcomes the opportunity to work with your design teams advising on the best practices in component, sub assemblies or modules design, ensuring that cost efficient re-use, remanufacture or simply ease of disposal opportunities are maximised. Our Mission is to be regarded as experts in the re-manufacture of electro-mechanical modules/ assemblies. Click a segment for more details. Learn the module application and customer expectations. Understand the module design and component functionality. Learn the failure modes- Critical to know the reman process will capture all failure causes. Develop re-use criteria for all components. Ensure capability of new materials. OE materials/components preferred. Rigorous field trials. In-house testing to ensure functionality and life. Understand assembly requirements and settings- dedicated tooling and fixtures to provide capability. Fully trained workforce participating in the development of the process and FMEA’s. Robust final inspection. 100% machine test often used. Continual improvement as process matures. Build team involvement. Work closely with customers’ & supply chain from design through manufacture to field support specialists. APD have been at the forefront of the re-use/recycling industry, saving over 100,000 tonnes of landfill in the past 10 years.